When Honeywell invited me out to Phoenix this May, one of the many cool things they told us about was their IntuVue 3D radar. They said they fly into thunderstorms to test out their concepts. Being a weather nut, I said, "Take me with you!" This week in Dallas, they fulfilled my request. As we were dropped off at a Love Field FBO (fixed-base operator) there wasn't a cloud in the sky. 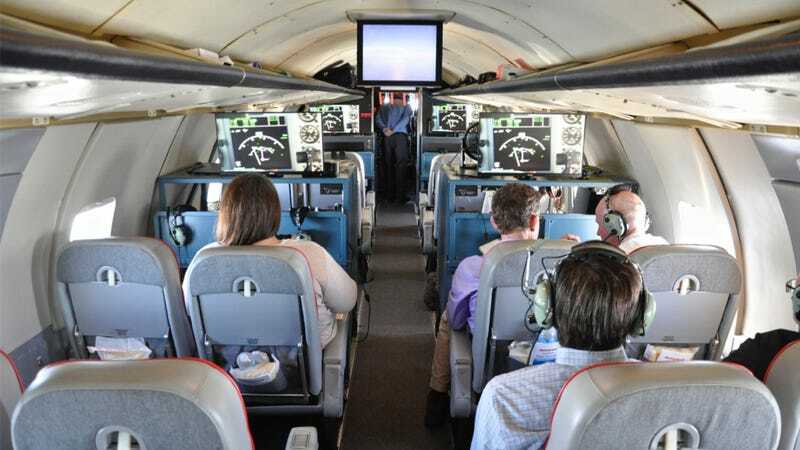 On the ramp, I saw the same historic Convair 580 that I had flown on earlier this summer toward some mountains as Honeywell demonstrated their Enhanced Ground Proximity Warning System (EGPWS). In spite of the lack of clouds, I remained positive. Having grown up in Houston, I knew that pop-up "sea breeze" thunderstorms were a daily occurrence along the Gulf Coast this time of year. I boarded the plane and claimed a window seat in the front row. In front of me was a rack of hardware housing many of Honeywell's various avionics projects. On top of the hardware rack was a large monitor, displaying a live feed from the cockpit which showed the IntuVue radar. It confirmed there were no storms in the North Texas area. At 13:10 local time, we fired up the twin Allison 501-D13 turboprops, taxied out to runway 13L and departed, heading south as I expected. We climbed to 21,000 feet as we made our way toward HUB — the VOR (VHF Omni-directional Range) for Houston's Hobby Airport. Honeywell's Chief Test Pilots, Markus Johnson and Joe Duval had found a few storm cells right on the coast. Even though we were over 180 miles away, IntuVue was able to scan for and accurately locate storms at that distance. IntuVue found storms on the Texas Gulf coast during my flight. Original weather radars dating back to the 1960s were manually-operated. The radar, which is located in the nose "radome" of the plane required the full attention of one of the pilots, because it had to be adjusted by hand to scan different altitudes of the flight path ahead of the aircraft. Those early radars used a high-powered fan beam that broadcast a Doppler signal at about 65,000 Watts. From the mid 1970s until the mid-1990s, they used a low-power narrow beam that scanned the atmosphere in layers, but still required manual manipulation from a pilot. Nearly 50 years later, most systems being used in commercial planes still have the same technology, with single or dual scan radars. Honeywell's RDR-4B radar powers their IntuVue system. Photo courtesy of Honeywell. Honeywell's IntuVue 3D is the first 3D weather radar application. It's also the first and only fully-automatic radar. It scans from ground level all the way to 60,000 feet, and has a range of 320 nautical miles. The long range is an asset, as it provides pilots the opportunity to strategically plan their routes around or between storms, minimizing delays and saving precious fuel for the airline. It can also predict hail, and identify storms with potential lightning five to ten minutes before it happens. And one of its biggest benefits to pilots is that it works without them having to tilt it to the level they want to scan. This gives both pilots free hands to fly the plane. Having a vertical picture of weather that's above and below the aircraft benefits pilots, and helps them avoid having to make rushed decisions. As planes are on approach to airports, traditional radars provide only a 120-degree view in front of the plane, so pilots making turns at various vectors are left with an incomplete view of the weather until they've turned into its path. IntuVue also exceeds industry standards in the realm of windshear detection. It scans a wider area — 80 degrees versus the standard 60 degrees, which means windshear can potentially be detected 5-10 seconds earlier. Its ability to detect turbulence up to 60 nautical miles away helps reduce the number of incidents of crew member and passenger injury. Who is using IntuVue? Southwest Airlines was the first airline to adopt the system, which is installed on all new Boeing 737s it is receiving. To date, Southwest is flying 73 737-800s equipped with IntuVue. I'm writing this piece while on board one of these aircraft, over central Texas at this very moment. What does the future hold for weather radar? Expected in 2017, Honeywell's "Hazard v3.0" will aid in high-altitude ice detection and avoidance. Above 30,000 feet, ice crystals can form within convective storms. If these ice crystals accumulate inside an engine, they can cause engine damage and power loss, or what's known as Engine Core Ice Accretion. Airbus and Honeywell have already completed test runs with this on an A340. With innovations like IntuVue, flying continues to be and will remain the safest form of travel.